Don’t let manual parts orders or confusing software hassle you. Auto/Mate’s Parts module simplifies and streamlines your orders. 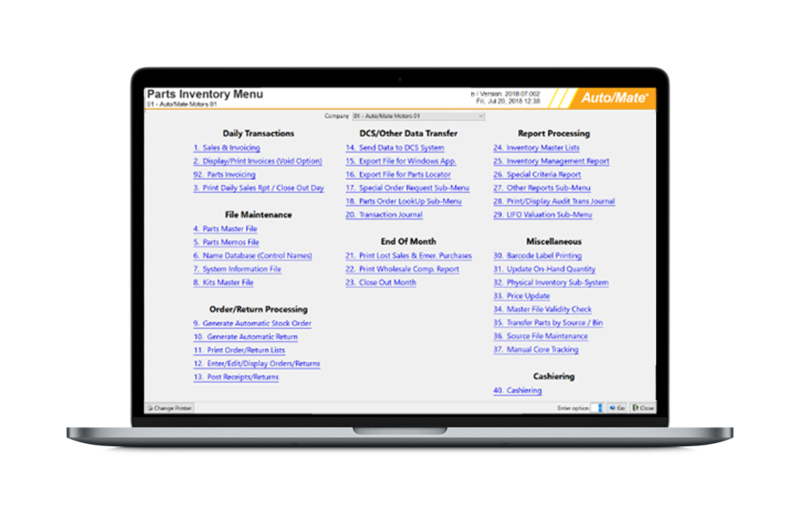 Auto/Mate’s Parts Module easily manages your parts department’s daily functions and inventory. We provide simple access to reports tracking your profitability and measuring important inventory metrics. Streamline your workflow and communications with parts scanning services and accounting products. This allows your counterperson to easily look up parts pricing, provides a glance at your fastest and slowest moving parts and sends parts order receipts over to accounting. Accurately submit orders and returns between the DMS and the OEM. Auto/Mate’s OEM integrations make placing your parts orders a breeze by eliminating manual orders, providing you ease and peace of mind.